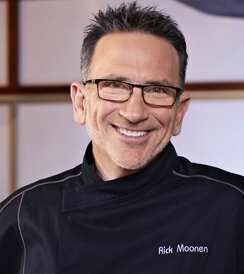 After graduating first in his class from the Culinary Institute of America, Moonen worked as chef and executive chef at many well known New York restaurants before becoming executive chef and partner at Oceana, receiving three stars from the New York Times. He then partnered to create Molyvos, a Greek fish house, which was the first Greek restaurant to earn three stars from The New York Times. After five years Moonen developed his own restaurant. As executive chef and owner of New York City’s rm, Moonen earned critical acclaim and, once again, received three stars from The New York Times. In 2005, he was drawn to the rapidly developing culinary scene in Las Vegas and closed his doors in New York City to bring his unique flavor and specialties of the seafood world to the West Coast. When not behind the stove, Moonen can be found throughout the country educating about the dangers of over fishing and the importance of ocean conservation. As an industry leader, he has testified for environmental and sustainable policy issues in Washington, DC and New York. He is a founding member of the Seafood Choices Alliances, which named him “Seafood Champion” in 2006, as well as an active member of the Wildlife Conservation Society, Seaweb, and a chef’s advisory board member of Ecofish.